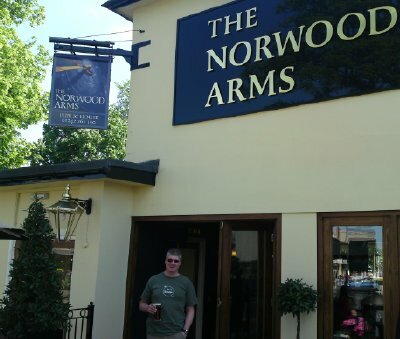 we had a very nice Ham, Egg and Chips for lunch in the Norwood. we were also somewhat tempted by all the fab cakes in Moran’s, but it was a little too soon after lunch..
the Beehive has been one of my favorite pub’s since I first moved to Cheltenham 5 years ago, but now I live within 10 mins walk of it as well! another favorite with a cool little smokers garden hidden away at the back. can’t go wrong with a glass of the “black stuff”! the Ha Ha is just under 20 yards from O’Neil’s, but we couldn’t resist another pavement seat and good view. I think we got a trainee cocktail waitress, she forgot to put ice in our cocktails! this is where Col first started “whinging” that I always managed to snag the chair with the best “view”, not sure what he meant. lol! looking forward to their annual weekend of putting real grass on the floor throughout the bar, it’s the first weekend in August. um, this was out idea of a “funny” pic… too much beer, or not enuff? yup, these two are literally next door to each other, or “in staggering distance” as it were. and to finish off the day we went for a curry at the Indus on Bath road. all in all a relaxing day wandering around Cheltenham pubs enjoying the sunshine!